Growing up Southern is a privilege. It runs a helluva lot deeper than just where you’re born. It’s a set of ideals passed down through generations. Sure, it’s about sweet tea and swimmin’ holes, front porches and fried chicken, magnolias and Moon Pies. But more importantly, it’s about being devoted to your roots; having a sense of place, of tradition, of family, hard work and each other. 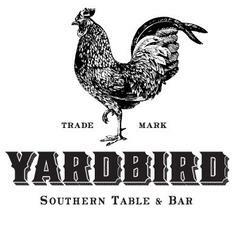 And those, my friends, should be universal ideals.<br><br><br><br>To that end, we proudly present Yardbird Southern Table & Bar. A house of worship to farm-fresh ingredients, classic Southern cooking, culture and hospitality. What we believe is a noble endeavor indeed. So stop on by, cop a seat and sample some made from-scratch divinity. We’re serving up the freshest, most inventive takes on regional Southern fare seven days a week with a foot-stompin’, soul-healin’ brunch on the weekends. We’ll keep a place set for you.